Innovative solutions, such as availability guarantees, car-sharing concepts, the use of condition monitoring systems or platform-based business models, lead to rapid upheavals in service markets. Successful companies have already recognized the potential of innovative business models. However, the service providers of these promising solutions are required to overcome some conceptional and operative hurdles before they can provide such innovative services successfully and stably. 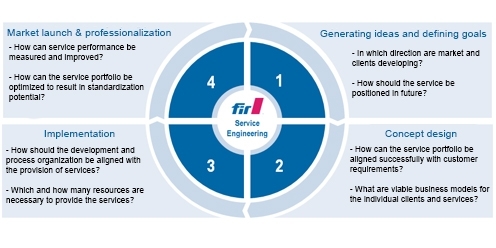 The specialist group Service-Engineering helps companies to structure the diverse issues involved in the development of innovative services, and to solve them step-by-step within an established and systematic process. The generation of ideas for innovative services, and the forecast of relevant markets are among the first steps of Service-Engineering, along with the definition of a company’s own corporate goals. Moreover, the quantification of added value for the client represents an essential task within the development process. Prior to the operative implementation in the development and process organization, the necessary services must be conceptualized. This includes, among other things, the design of a viable business model and the detailing of delivery processes. The decision regarding the provision of necessary resources and the (re-)orientation of existing company structures represent important stages prior to the actual implementation. Once these and other conceptional issues of business model organization have been answered and a new range of services introduced, it is a matter of continually checking and improving this performance bond.